Depending on your perspective, one of the wonderful, or intimidating, or annoying things about the holidays are the decadent recipes that only make an appearance once or twice per year. They’re more involved and thus reserved just for special occasions, a labor of love to bring them to the holiday table for all to enjoy. Take our recipe for croquembouche, for example. Does it take some effort to assemble? It sure does. But wow, does it make a show-stopping and delicious centerpiece! But that’s part of the allure of such recipes. As with love, absence makes the heart grow fonder. You look forward to the recipe all year, and it becomes intimately associated with a certain holiday or holidays, and all the eager anticipation that goes along with that. The making of the recipe, meanwhile, becomes family ritual alongside other traditions like trimming a Christmas tree. 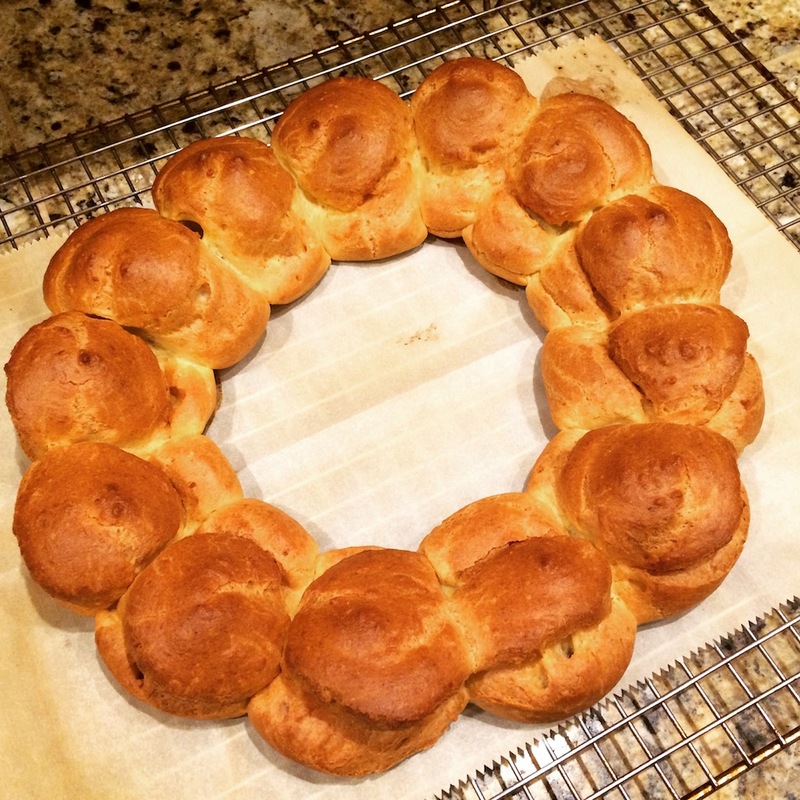 Like Kelli’s extended family, who for decades has gathered ’round the kitchen table to make a mammoth batch of kolachkis that gets slowly but steadily devoured over the course of Advent. 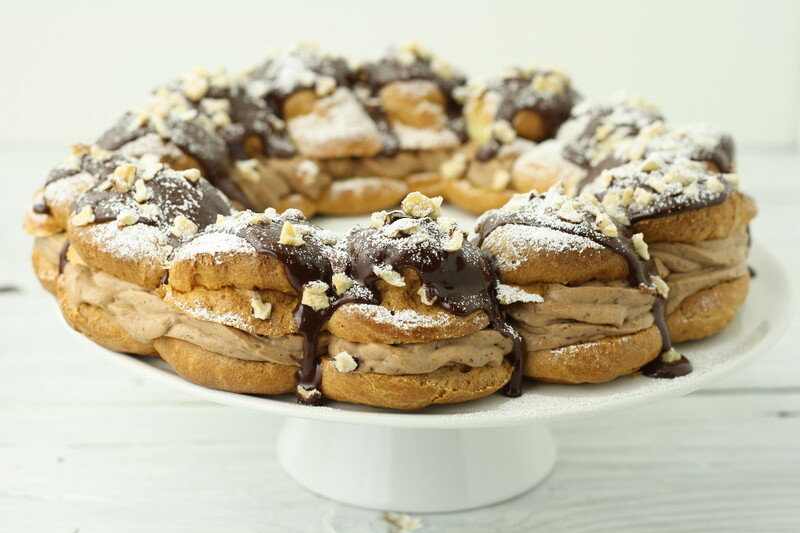 I suspect this new gluten-free recipe for Paris-Brest just might become another annual holiday tradition. Its peculiar name—at least to Americans like us—comes from a famous French bicycle race between those two cities that began in 1890. The pastry was created in 1910 to commemorate the race, and it’s become a widely popular dessert in France since. The pastry is made from pate a choux, and it’s shape resembles a bicycle wheel. But of course, it also looks suspiciously like a wreath, which it makes it perfect for the holidays. 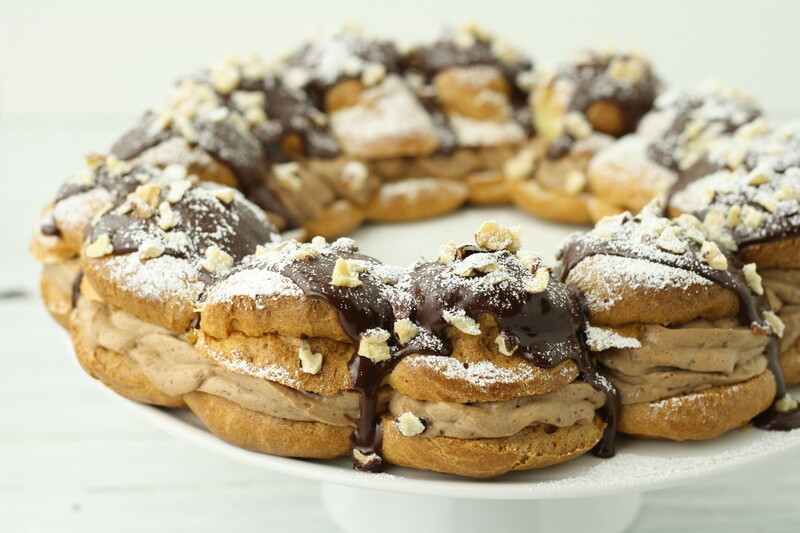 It took many tries for us to get this recipe “right.” Though based on the pate a choux from our croquembouche, that recipe required modification in order for the pastry to hold its shape for this Paris-Brest. 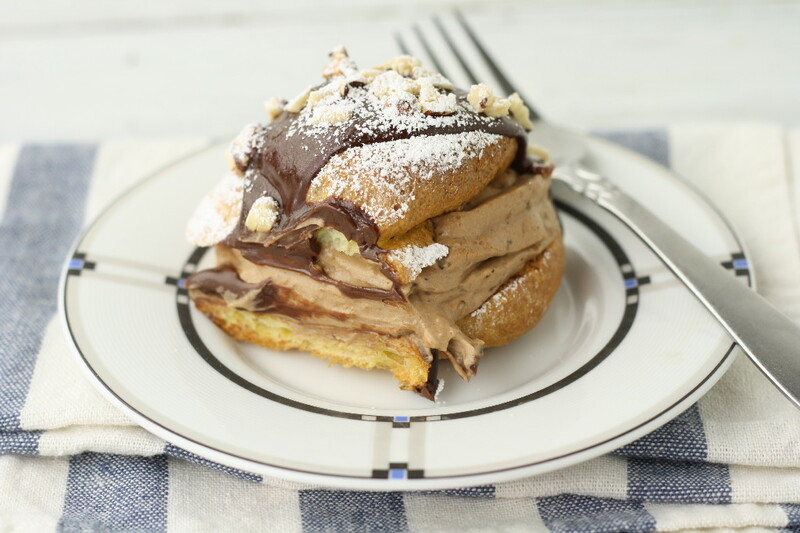 Compared to the golf-ball-sized profiteroles of the croquembouche this Paris-Brest has baseball-sized cream puffs! 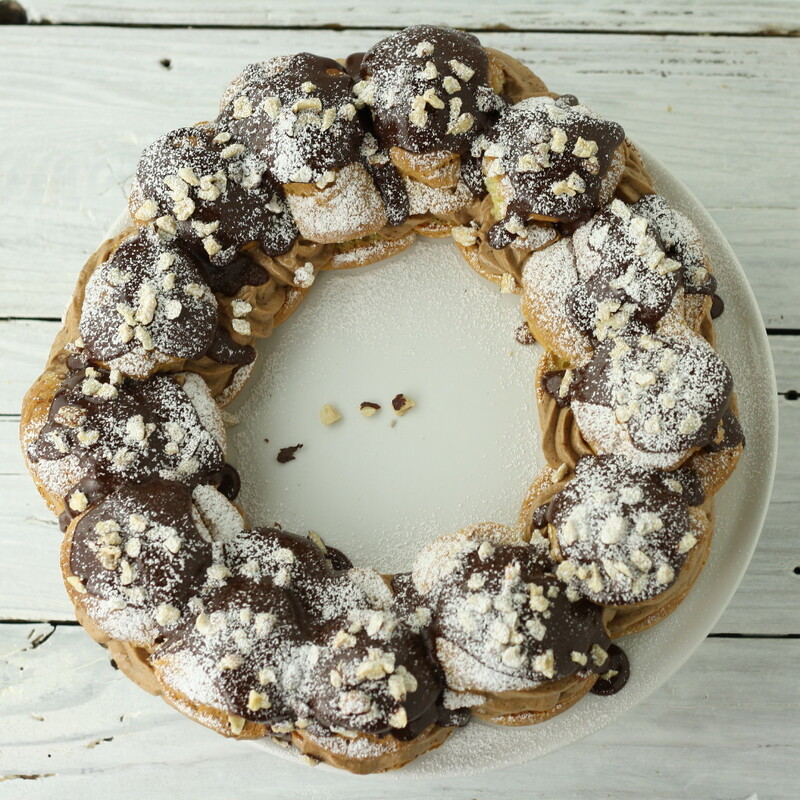 It’s then filled with a chocolate-hazelnut pastry cream, drizzled with chocolate ganache, and topped with chopped hazelnuts and powdered sugar. The result is a surprisingly easy dessert with some serious “wow” factor. Perfect for the holiday table with family gathered ’round. Add the hazelnuts to a saute pan and toast over medium-high heat, agitating occasionally, until slightly golden and fragrant (about 5 minutes). Be careful not to burn the nuts. Remove from the heat and let cool. Reserve 1/4 cup of the hazelnuts for garnish. Add the remaining 3/4 cup of hazelnuts to a food processor and grind until they form very fine crumbs (almost like a powder). Mix the sugar and cornstarch in a bowl. In a small saucepan, bring the milk just to a boil over high heat. Temper the eggs by gradually whisking in the hot milk. Return all to the saucepan. Bring back to a boil over medium-high heat while whisking continuously. Cook for 1 minute. Remove from the heat and stir in the vanilla, butter, and chocolate. Transfer to a glass bowl or similar, place a piece of plastic wrap directly on the surface (to prevent a skin from forming), and refrigerate until completely cool. Whip the heavy cream until soft peaks form. Loosen the chocolate pastry cream by whisking. Then add the ground hazelnuts and stir until combined. Then fold in the whipped cream. Preheat the oven to 425 deg F. Line a baking sheet with parchment paper. Draw an 8-inch-diameter circle on the center of the parchment (tracing a salad plate can work well). In a medium saucepan, combine the water, milk, butter, sugar, and salt, and bring to a boil over medium-high heat. Meanwhile, in a separate bowl whisk together the flour and xanthan gum. Add all the flour to the saucepan, stir in the flour over the heat until completely mixed and continue stirring vigorously until the dough pulls away from the sides of the pan. Remove from the heat and add the eggs one at a time, stirring vigorously each time until each egg is completely incorporated. Then continue stirring until the dough is smooth and glossy. Transfer the dough to a pastry bag fitted with a half-inch open tip. Bake for 25 minutes, then decrease the temperature to 350 deg F and bake for an additional 15 minutes. Turn the oven off and leave in the oven for an additional hour. LEAVE THE OVEN DOOR CLOSED THE ENTIRE TIME. Remove from the oven, transfer to a wire rack, and let cool completely. Using a serrated knife, cut in half horizontally (through the equator). Remove the top half. Add the chocolate-hazelnut pastry cream to a clean pastry bag, then pipe onto the bottom half of the pastry. Place the top half of the pastry back onto the pastry cream. Then make the ganache: heat the cream, then add the chocolate, whisking until smooth. Drizzle the chocolate ganache generously over the top of the pastry. Top with the one-quarter cup reserved chopped hazelnuts. Making the chocolate-hazelnut pastry cream can be done 1 day in advance. Keep in the refrigerator until ready to use.